I’ll admit to being far less familiar with brandy as I am whiskey. And yet, when dabbling in brandy, I find myself drawn to Armagnac, as opposed to its better known sibling, Cognac. Both are made by distilling wine from each region (Cognac from the area surrounding the French town of Cognac, and Armagnac from the Armagnac region in Gascony, which is in the southwest France) and then aging it in oak barrels, often for extended periods of time. But there are key differences between the two that give each its own character. Cognac tends to be more corporate with a few big name producers, while Armagnac has smaller, family-controlled producers. Traditionally, cognac is distilled twice in pot stills, while Armagnac is distilled only once in a column still. Armagnac fans will tell you the single distillation leaves the spirit with more complexity and character. Today, I’m exploring two expressions from Tariquet, a well-known Armagnac producer from the Bas-Armagnac subregion (one of three Armagnac geographical classifications). The company relies mostly on a combination of Ugni-blanc (60%) and Baco (40%) grapes, two of the ten grape varietals permitted for Armagnac production. 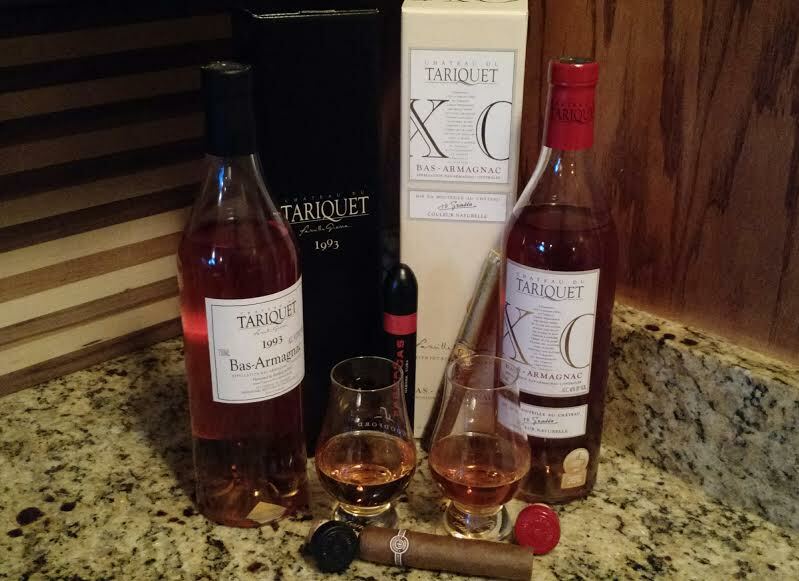 Aged for 12-15 years (longer than the required 6+ years for the XO designation), Tariquet’s XO (80-proof) expression is light copper in color with a nose that features oak, almonds, and toasted coconut. There are full flavors on the palate with wood, fruit cake, and chocolate followed by a warm spicy finish. Distilled in 1993 and bottled in 2010, this vintage offering (90.4-proof) features a golden straw color and a nose that is bright with candied orange, honey, and nougat notes. On the palate there is vanilla, soft oak, pie crust, and citrus. The finish on this refined but powerful Armagnac is long and rich with dates and butterscotch. Both are enjoyable in their own way. The extra age of the 1993 manifests itself as sophisticated, complex, and elegant. The XO is grittier with more wood and spice, but both are worth the extra cost versus the VSOP Tariquet, which is the only expression I was familiar with before this article. These spirits also make for natural pairings with a fine cigar. The XO calls for woodier, spicier smokes like the Cuban Hoyo de Monterrey or a Dominican Fuente Opus X. For the Vintage 1993, I’d suggest balanced, nuanced cigars like the Cohiba Behike or Nicaraguan Illusione Epernay.